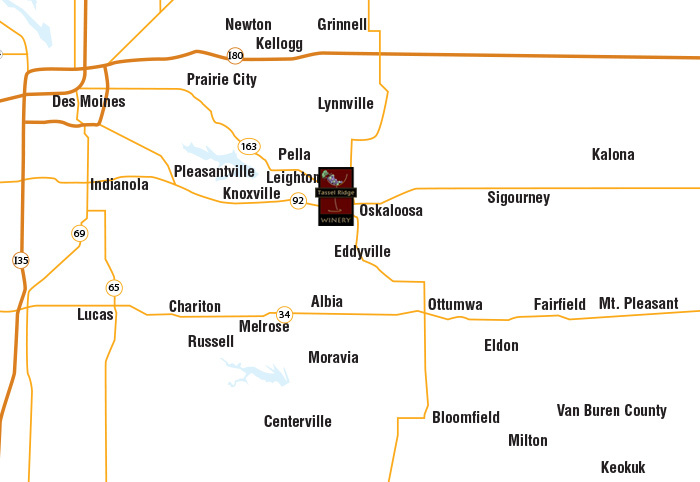 Visit Tassel Ridge Winery at the heart of Iowa’s Wine Country in Leighton, Iowa, between Pella and Oskaloosa on Highway 163. Tour the Winery and learn how the grapes grown in our vineyards become award-winning wines. Weather permitting, take a tour of our vineyards on the Tassel Ridge Winery Grapemobile. Taste our wines, ranging from dry to sweet. Shop for wine-related items, local cheese, chocolate, and more in our Gift Shop. While you’re here, take in the events, history, architecture, shopping, antiquing, golf, and recreation nearby. Click on the town for more information, places to see, and where to stay.